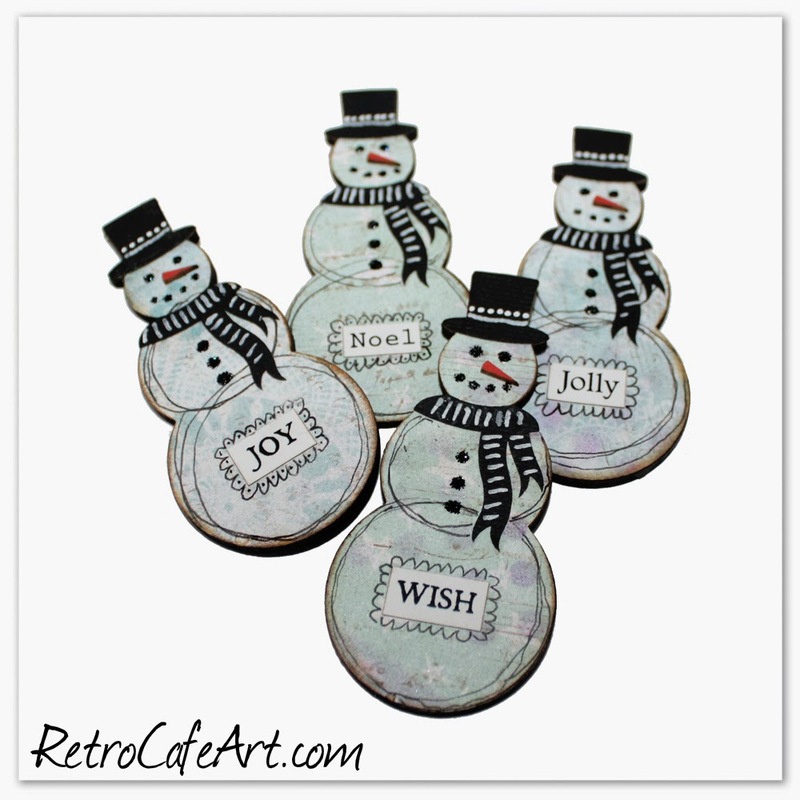 Snowman Magnet Kits and More! Happy Weekend Everyone! 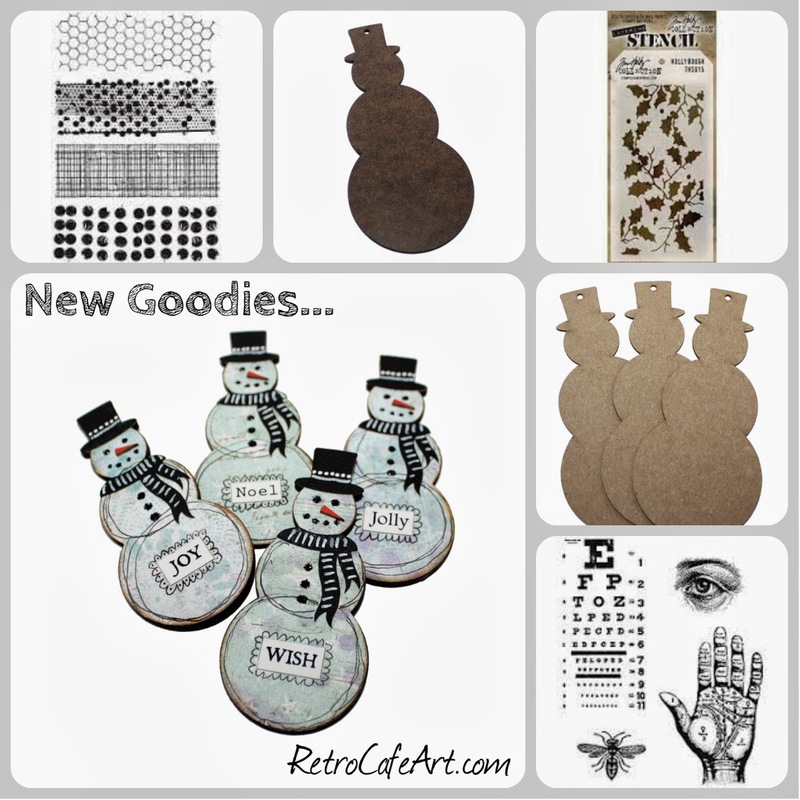 We have some lovely new goods in the shop including some handsome snowmen, Tim Holtz Stamps and Stencils, Charms, and more! Why fight the crowds when you can stay home and shop in your pajamas! CHECK IT OUT HERE. I made these mixed media snowman magnets for our Angel Ornament Swappers and just in case you would like to make some too, I put together a kit for you! Supplies Used: Snowman Magnet Kit, Christmas Word Paper Cuts Classic White, White Sharpie Paint Pen, Black Diamond Stickles. Victorian Scrap Angel Ornaments and More! I had a blast playing with the new ornaments! Since the surface is a bit smaller than the full size angels, they are faster to make. I whipped these gals up pretty quickly! They would make fantastic gifts for your family and friends. Handmade is always best! 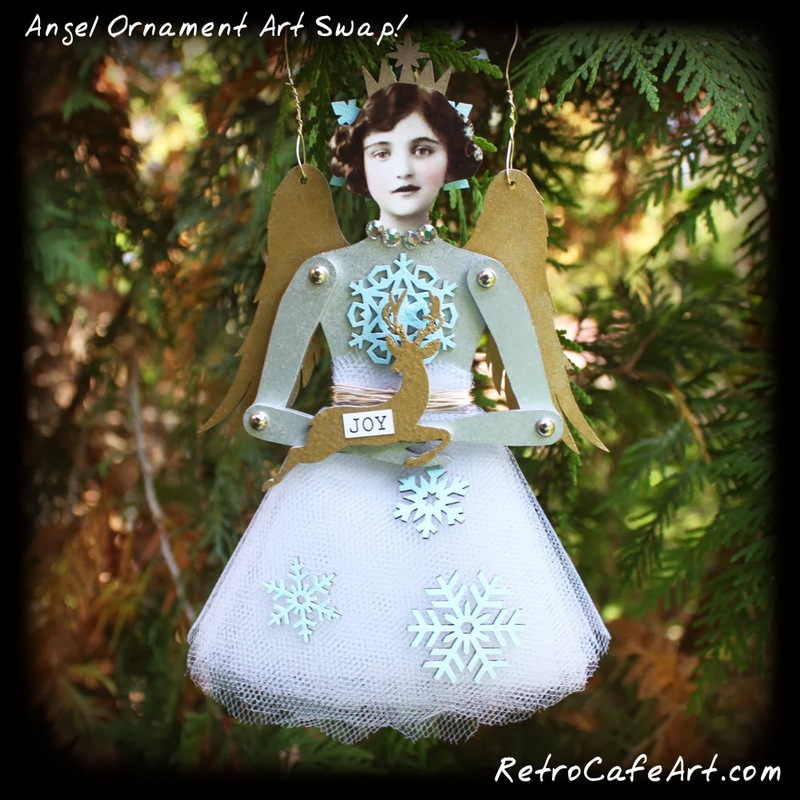 Here are the supplies I used: Victorian Scrap Angel Ornaments Style 1 and 2, Angels and Saints Doll Head Paper Cuts, VerDay Paint and Patina Set, Gold Doilie Rub Ons, Snowflake Cut Outs, Peace Dove Cut Outs, Mod Podge, White Sharpie Paint Pen. 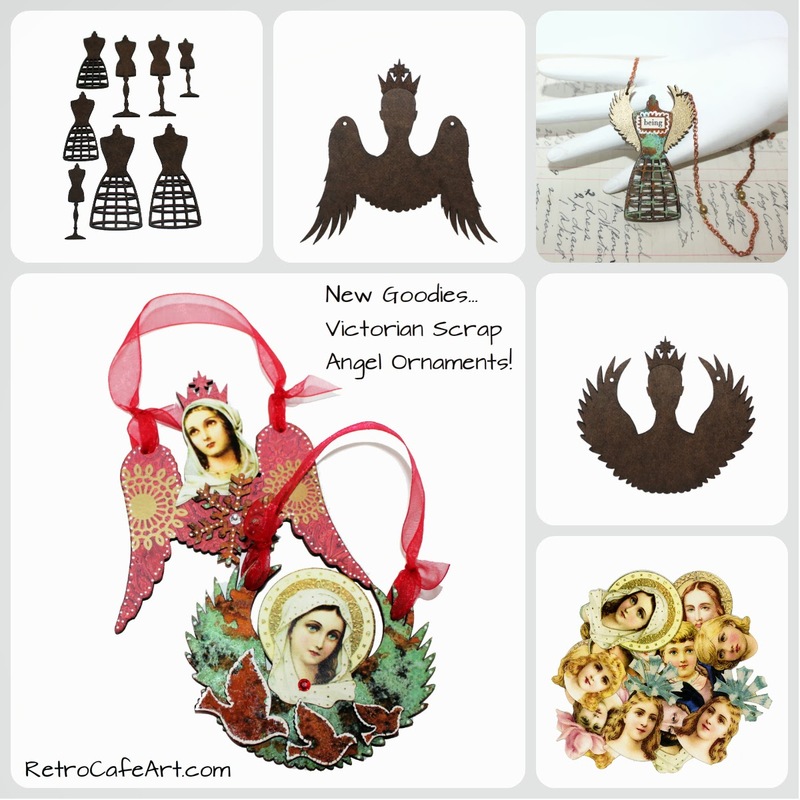 The new Dress Form Cut Outs and Small Angel Wing Cut Outs are just the right size for jewelry and small ornaments so I had to give them a try. I created this sweet necklace which I plan to give as a gift to a sweet friend! 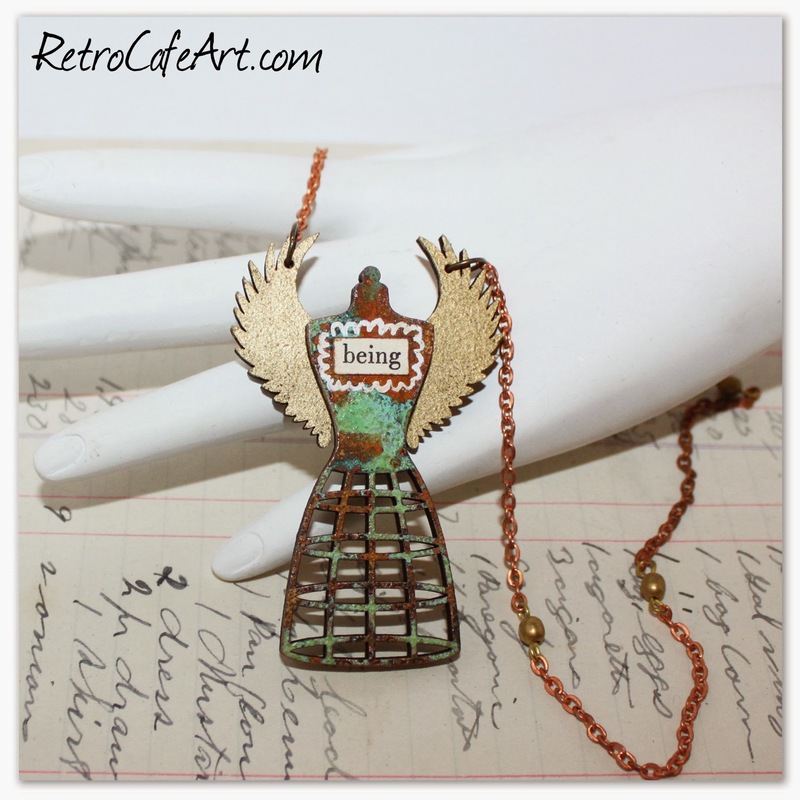 Here are the supplies I used: Dress From Cut Outs, Small Angel Wing Cut Outs, VerDay Paint and Patina Set, Mod Podge, White Sharpie Paint Pen, Vintage Copper Bead Chain. Sugar Skull Magnet Kits! 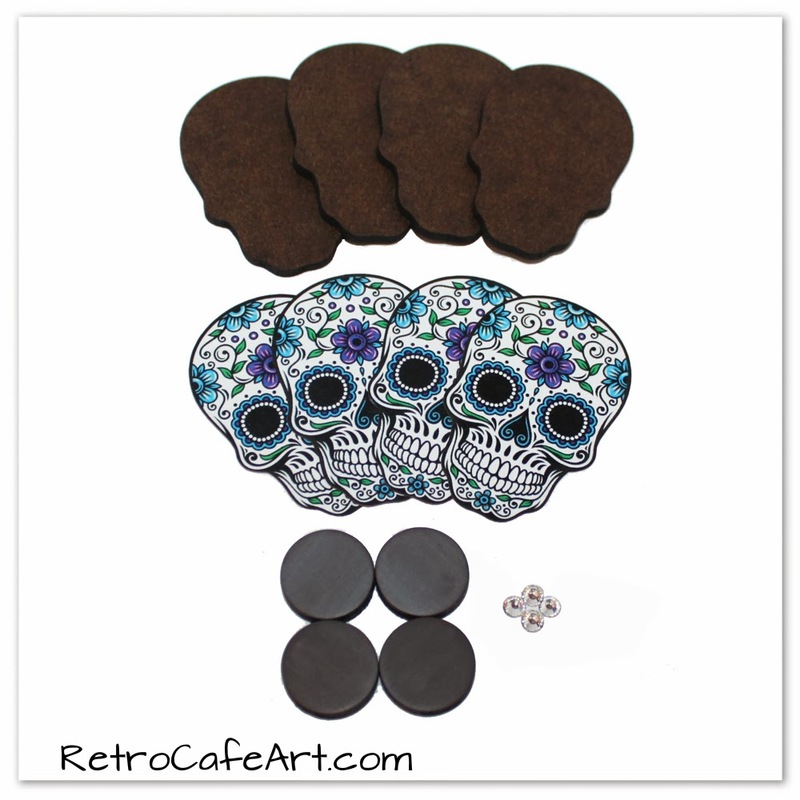 A few weeks ago I made some Sugar Skull magnets as gifts for the DOTD swappers. Since so many of you asked for a tutorial and/or a means to buy some, I listened! Not only is there a tutorial, but there is a KIT so you can have some fun and make your own! Grab them while you can! Swap Reminder! Angel Ornament Swap Reminder! Angels are due December 2nd. Details HERE. Please note, that is the Monday after Thanksgiving, just over a week from now, so be sure to get them in the mail by early this week! 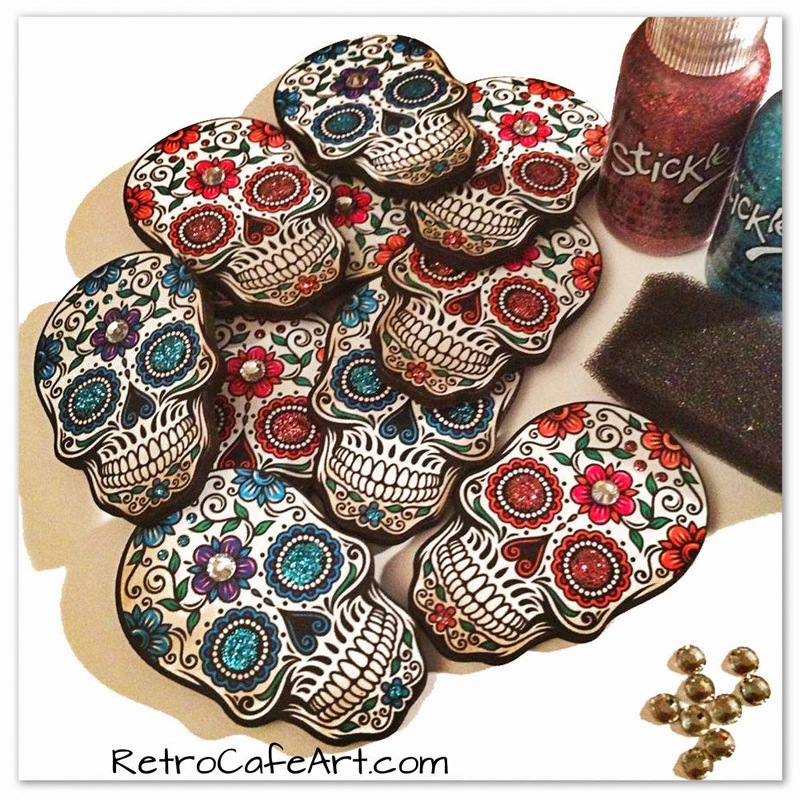 Sugar Skull Magnet Tutorial + a Kit! And then I decided to have a giveway with the extras! So many of you asked for a tutorial and/or the ability to buy them, so here we are! And even better than that, I have put together a KIT for you, so that you can make your own Dia De delights! All you need to do is add the glitter, glue, and anything else you would like. They are available in two colors and you can find them HERE! The Tutorial (couldn't be much easier! ): First, grab yourself a kit. Each kit will make four! If you want to add color to the back of your magnet, I recommend doing that before attaching your Sugar Skull Paper Cut. I painted the back of my Masonite base with basic black acrylic paint so that I could sign them with a White Sharpie Paint Marker. Attach your Paper Cut to the base using Mod Podge or a similar glue. If you wish, you can ink the edges. If you want to seal your piece, you can do that now. I used a Spray Acrylic Sealer to protect my image. 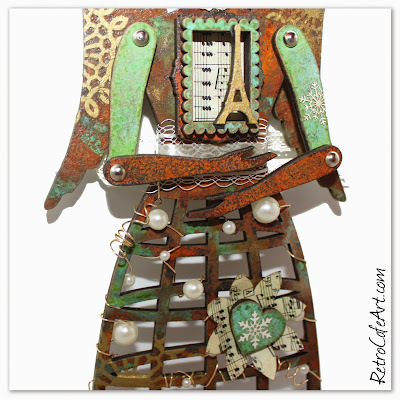 You could also use Mod Podge, Diamond Glaze, Glossy Accents, Crackle, Resin, etc. Next add some bling. I used Pink and Turquoise Stickles, and then finished off the piece with a Swarovski crystal. Finally, attach your magnet using a strong glue such as E6000! 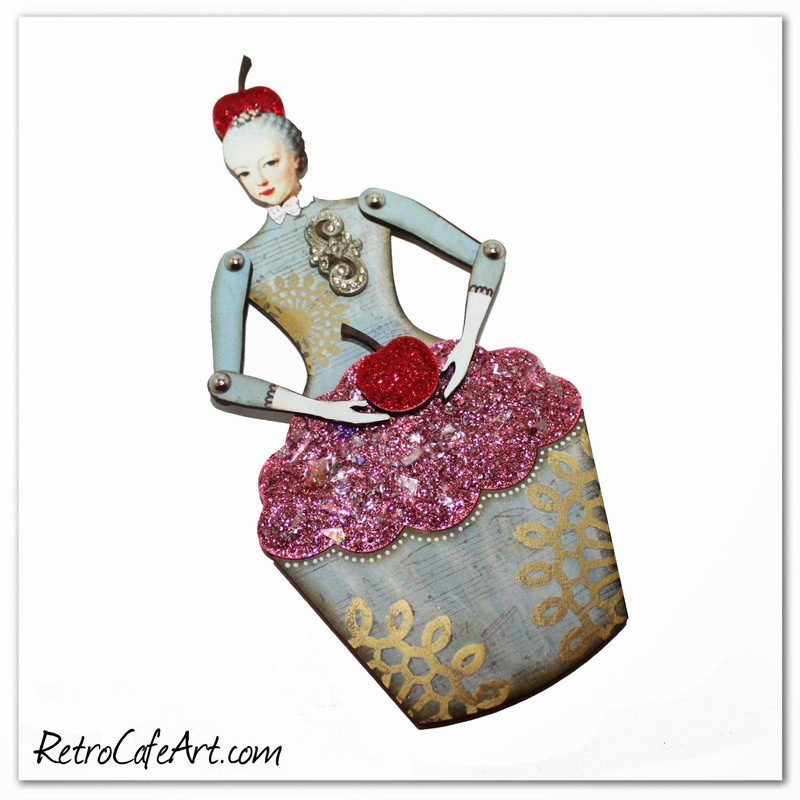 Sugary Sweet Marie Cupcake Dolls & Much More! Happy Weekend Everyone! 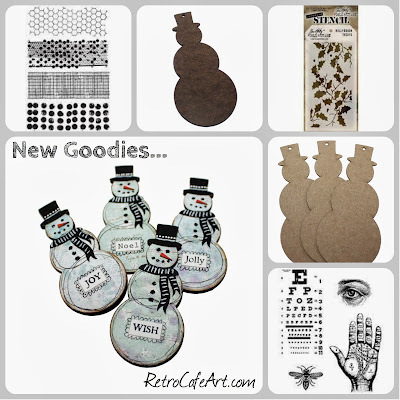 Keeping with last week's theme, we have some exciting new goodies in the shop! As soon as I designed our Dress Form Dolls last week, I knew what I was doing next! 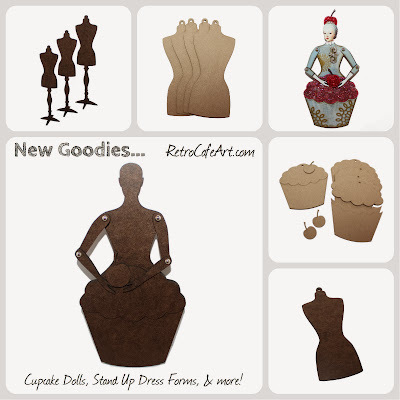 CUPCAKE DOLLS! 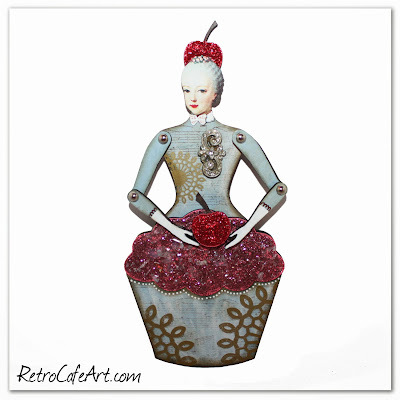 Very Marie Antoinette "Let Them Eat Cupcakes"! A very 3-D version of one of my favorite Marie Collage Sheets from 2009! 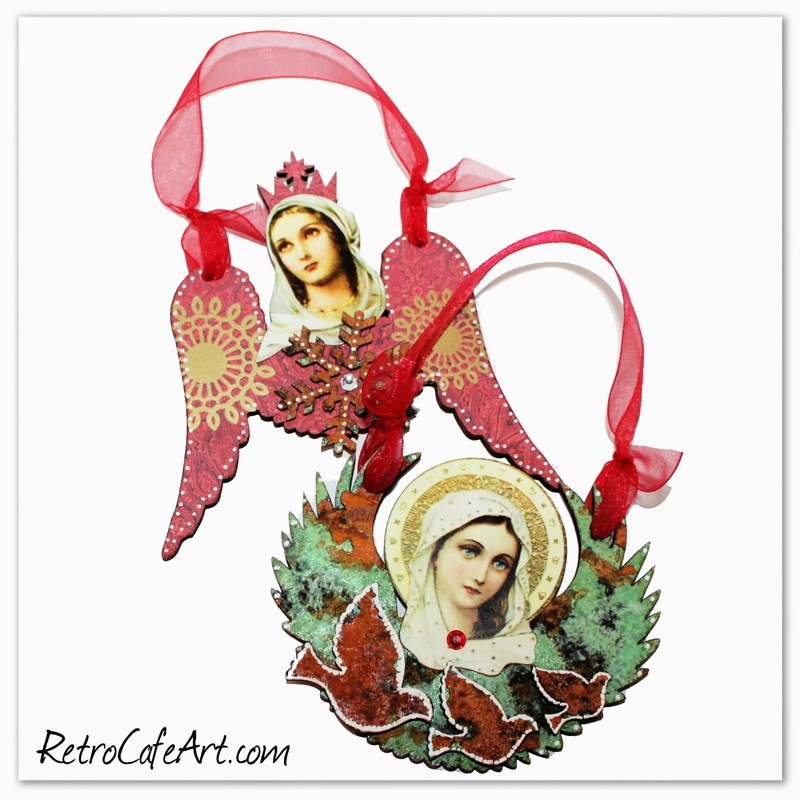 They are the perfect compliment to all of our Doll Kits! They are so sugary sweet, you'll want to eat them up! Of course I jumped right in and played with one of the new gals! Here are the supplies I used: Small Cupcake Doll, Marie Doll Head Paper Cuts, Gold Doilie Rub Ons, Pink and Red Stickles, White Mica Flakes, White Sharpie Paint Marker.) 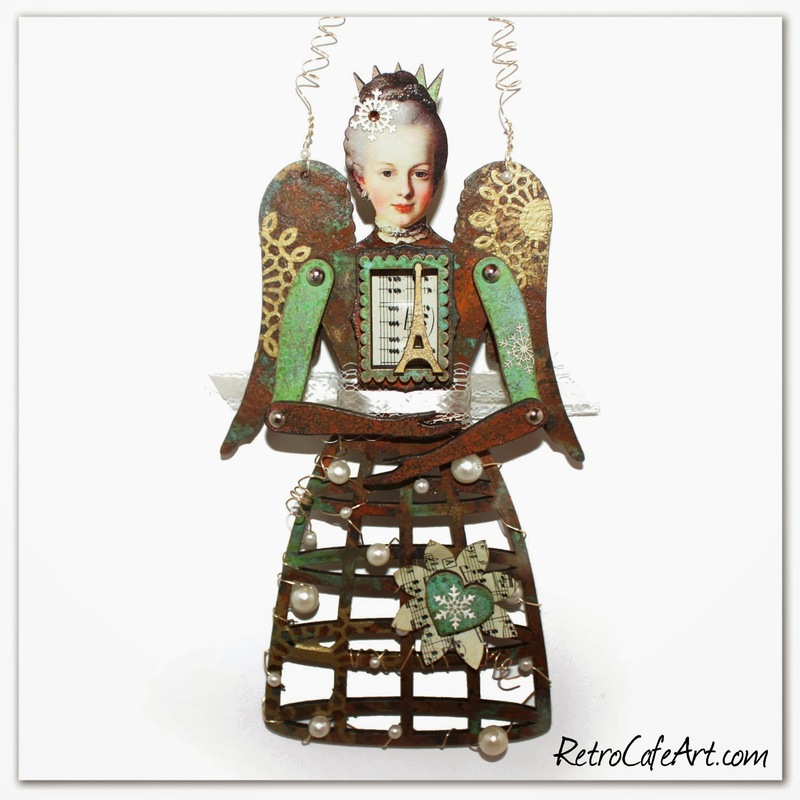 Find even more fun goodies in our French Inspired Section. My favorite part about the Doll Kit has to be the CHERRRY HAT! I giggled when I was designing it, and I'm even more giddy now! The Stickles really make it pop. And I'm also amused that the bare Masonite, made for the perfect cherry stem! layer of hot pink paint, and then I covered the entire thing with Pink Stickles. While it was still wet I sprinkled on some Mica Flakes. LOVED the result. The photo below shows it better. Oh, and I was also excited that the bit of vintage bling I used looked like an "S" for sugar :). 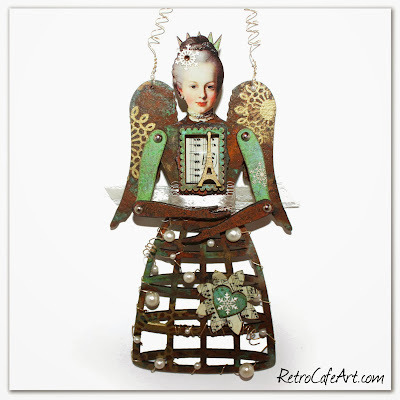 Design Team Member Linda Cain created this stunning Votive House Ornament! You can find more photos and step-outs on Linda's blog. 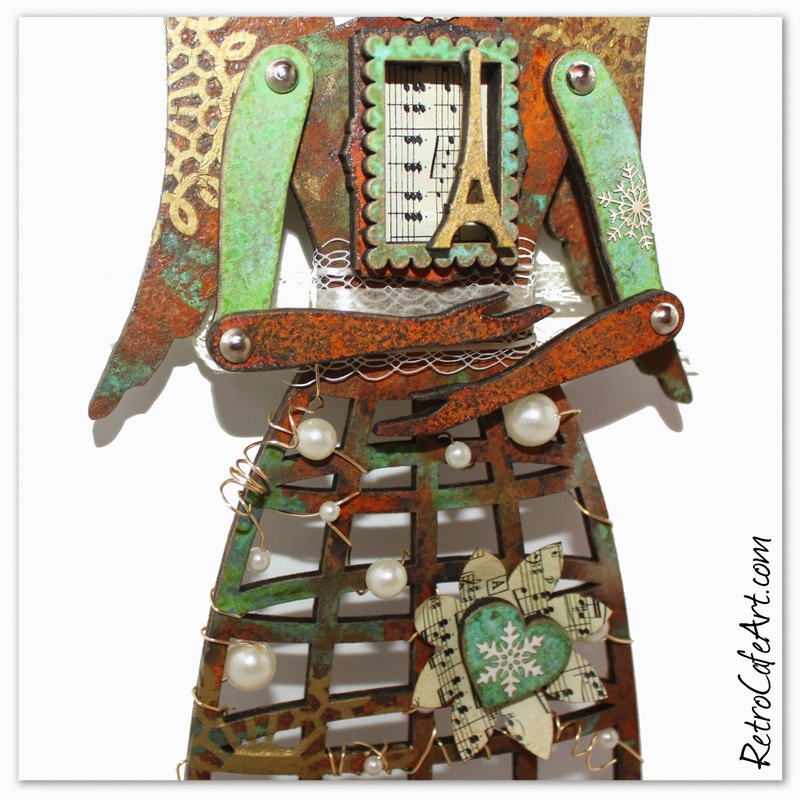 I adore the way she used the Scalloped Dresden as shingles! Always thinking! Angels are due December 2nd. Ooh la la Dress Form Art Doll Shrine Kits & More! Happy Weekend Everyone! We have some exciting new goodies in the shop. 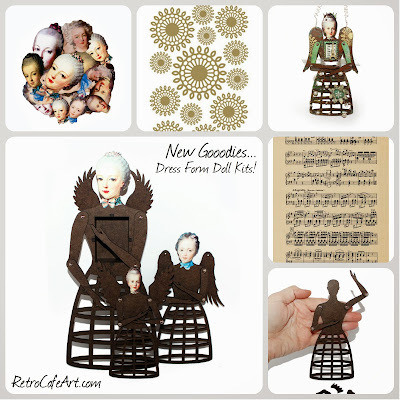 Dress Form Art Doll Shrine Kits!!! So in love. 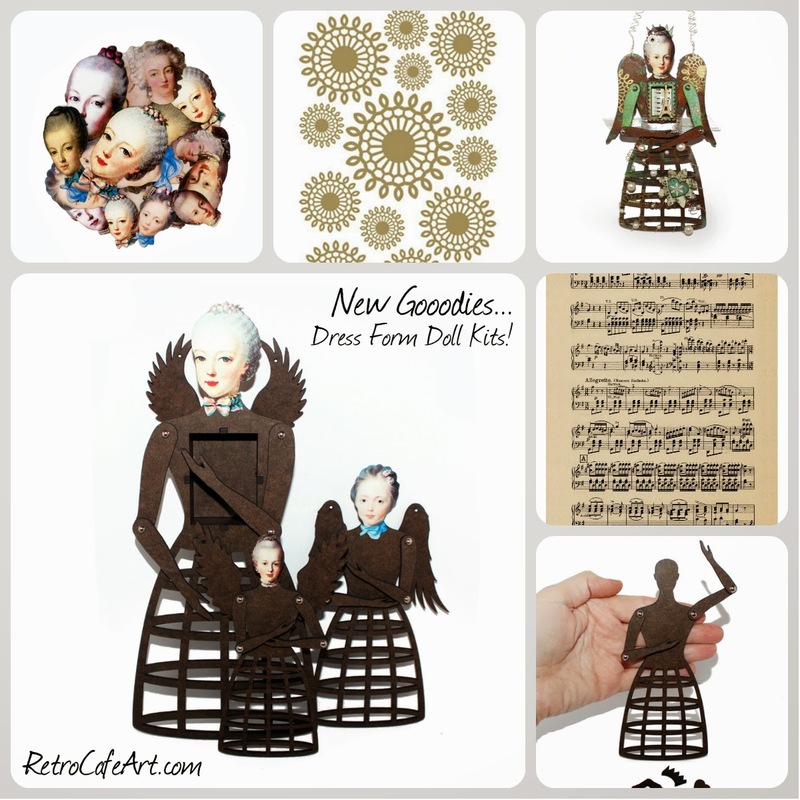 They are the perfect compliment to our Theatre Doll Shrine Kits, Angel Ornaments, Fairy Shrine Kits, and well, just about all of our Doll Kits! And of course you NEED Marie Antoinette Head Paper Cuts to go with those Dress Forms. We have those too, and much more! 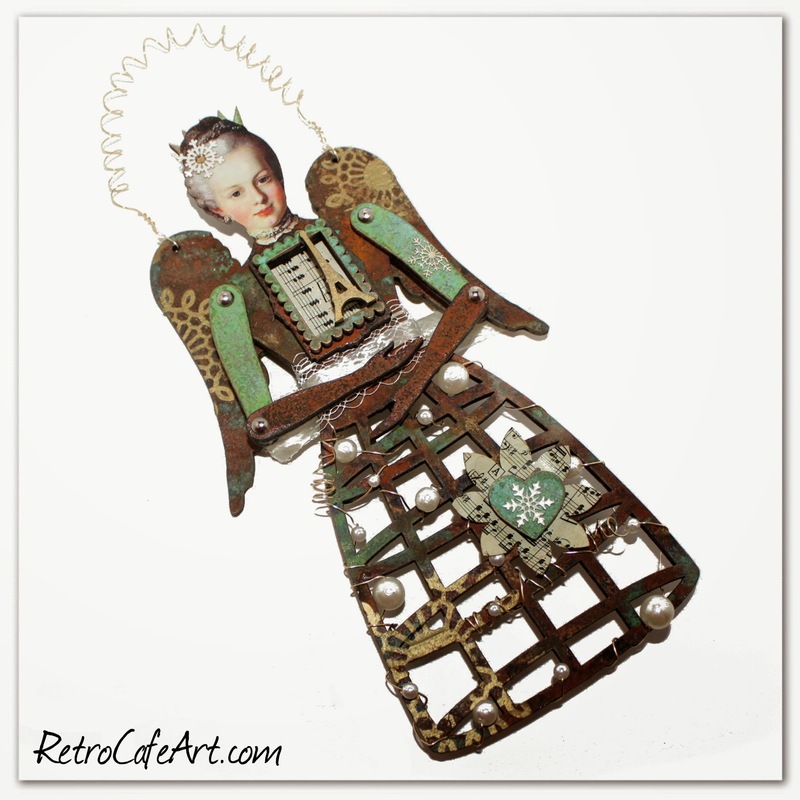 Medium Dress Form Art Doll Kit, Marie Doll Head Paper Cuts, Angel Wing Cut Outs, Gold Doilie Rub-Ons, Vintage Sheet Music Collage Sheet, Eiffel Tower Cut Outs, Pearls Bead Mix, Gold Wire, Snowflake Paper Cuts.) Find even more fun goodies in our French Inspired Section. Can you say texture? Yum! Angels are due December 2nd. Come play! Breaking Bad & Sugar Skull Sweetness! 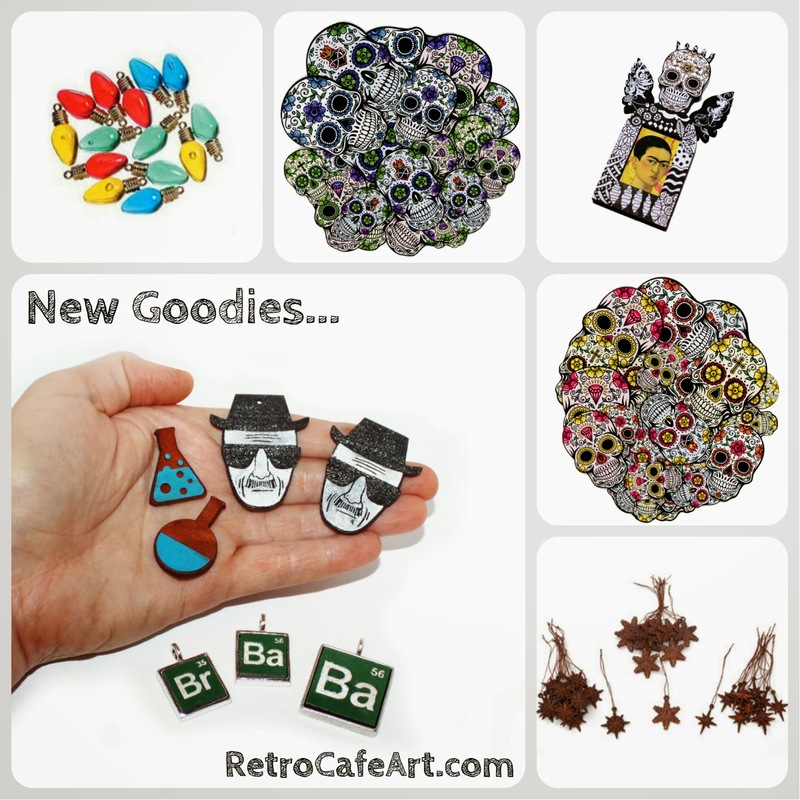 If you are a fan of the show, Breaking Bad, you will love this week's goodies. 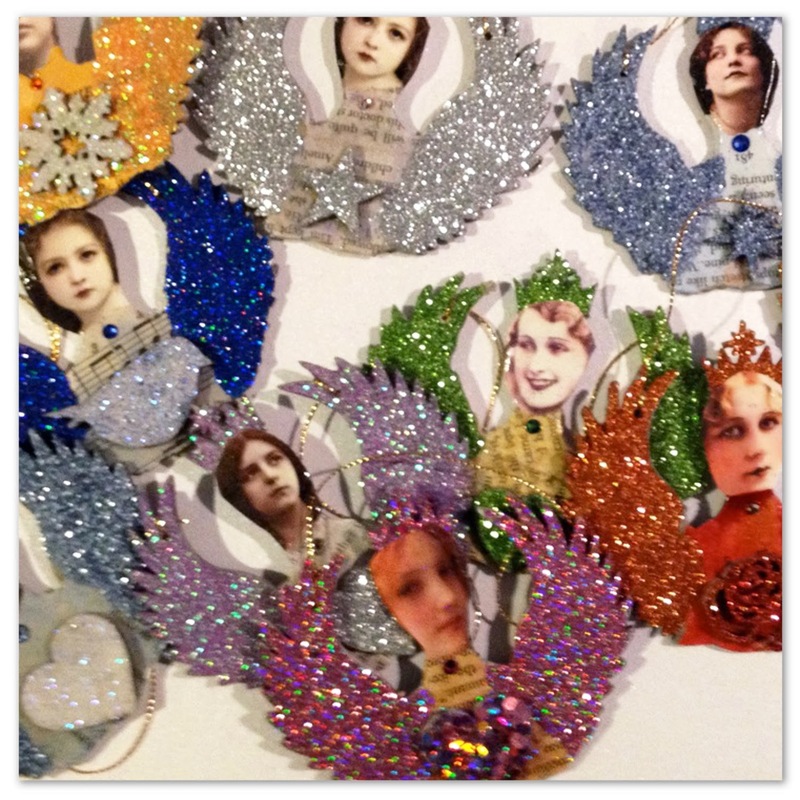 Inspired by the talented Deb Moon (see below), we cooked up some fabulous Cut Outs. 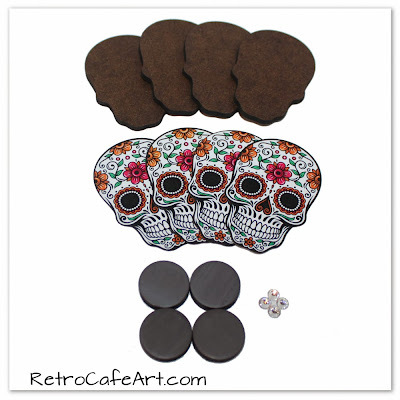 AND since it is officially Dia De Los Muertos, we had to add some stunning Sugar Skull Paper Cuts as well! You will also find some lovely Christmas supplies and Minis. A little bit of everything this week! You can check it all out HERE! We recently hosted our 2013 Gothic Tombstone ATC Swap and all of the entries were nothing short of fabulous! Deb Moon, being a fan of the hit show Breaking Bad, centered hers around this unique them. The details were incredible, and being a huge fan of the show myself (you must watch! 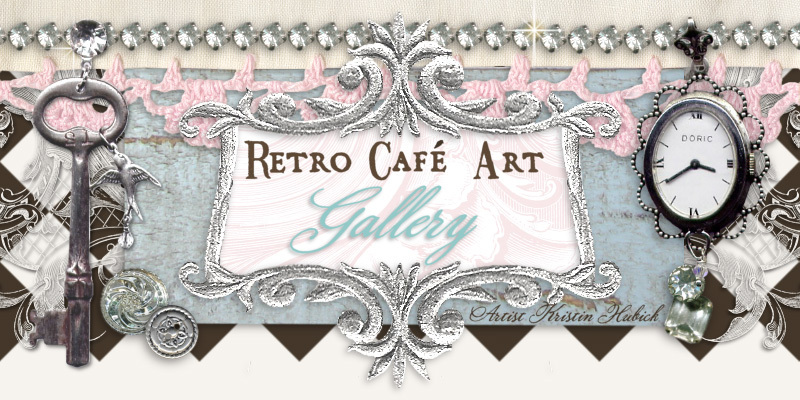 ), I decided to design a few embellishments! Thank you Deb for the inspiration and for your wonderful tombstones! We now have Heisenberg Heads, Periodic Table Cut Outs, and Chemistry Bottles (add your own "blue stuff"), in the shop! Design Team member Linda Cain created these fabulous DOTD shrines for our swap, but also posted awesome photos and tips on her blog for you! What a wonderful way to celebrate Dia De Los Muertos, which happens to be going on NOW! Check out Linda's blog post HERE. Reminder! 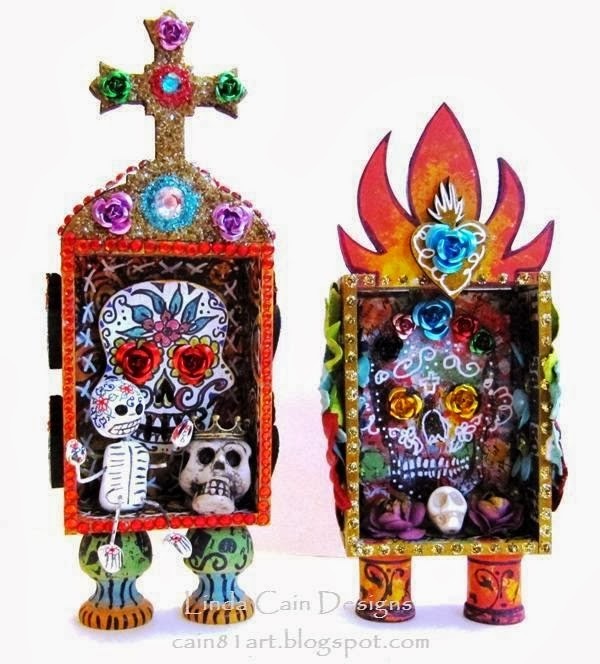 Shrines for our Mini DOTD Swap are due Monday November 11th! Several have arrived and they are FABULOUS!